Ha yes, I have been watching you for some time now. You did not see me at all. No wonder, because I am a master of disguise. You humans like to call me the wizard of the forest, because of my fluffy ears and pointy beard. People often only find my big paw prints, but they don’t see me. And I love these games of stalking and sneaking up on other animals. You know my big furry paws help me with that? It’s really my favourite thing to do. Why do we do the interview so early? Well, it’s quite simple. Most of the time I am only active during dusk and dawn. I’ve got a lot to do every day, you know. My territory is about 400 square kilometres, that is more than 50,000 of those football field! And I need to check if there are intruders around. I have to mark my area with some pee or scratch marks, that will warn the others not to come here. Aren’t you lonely up here? I like to be alone, really. Well, most of the year. Only during early spring, I will look for a new partner, but the rest of the year I prefer to live by myself. And actually, I’m not really alone. I like to live in places where there are enough other animals around. I would say my best friends are roe deer. Haha yes, funny. I love those roe deer, they taste so good. I prefer to eat about two kilograms of meat per day, so those roe deer are the perfect meal for a few days. It is like room-service, dinner comes walking to me every time. I just use my powerful legs and jump right on them. And although they are quite fast, they are not so flexible when I chase them through the woods. But if there are no roe deer, I usually go for some smaller rodents. Sometimes I like to catch something like a red deer, but those guys have dangerous antlers. I prefer not to get stabbed by those things. Nah, not really. I prefer to stay hidden in this mountainous forest. I must admit, sometimes I would like a sheep, but only if it’s not too much effort. Nowadays people finally start to understand why it was so easy for me to catch sheep. These owners did not protect their animals. If I come down to the farms now, I see more and more of these electric fences and stupid dogs. They are really problematic and ruining the fun for me, I rather stay in the woods in that case. Do you have trouble, finding enough food here in Europe? It is not really the problem of finding enough food. There is a lot of wildlife in Europe, so there is also enough food for me. But my relatives in many countries disappeared because they were hunted down for their fur. Now people are not allowed to hunt me anymore, so my family grows slowly. Most of my cousins are actually found in eastern Europe and Scandinavia. Unfortunately, my uncle Alus recently died in south Germany, he was also killed by your kind. Alus was a nice guy to me, never really hurt anybody. 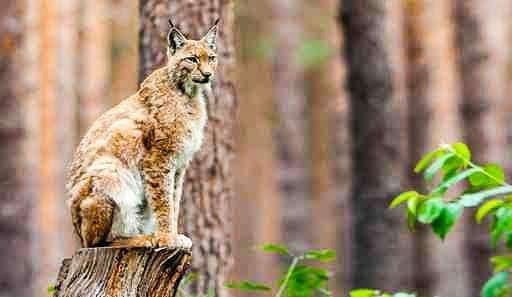 What about the Lynx reintroduction plans in Great Britain? Yes, that would be great! My ancestors used to live in Great Britain 1,300 years ago, until they were all killed for their fur. Look at the place now, they have an overpopulation of deer damaging the plants and trees. And their crows and pine martens are stealing the eggs of the capercaillies, beautiful birds. Not to mention the foxes that eat them once in a while. Oh, how I would love to get some pine martens as an evening snack! But I must admit I am a little bit worried. My friend, who escaped in Wales last month, was killed because people couldn’t properly catch it. It seems that you think killing is always the solution to solve your problems. Thank you for your time, will we meet again? Most likely you won’t see me anymore. But I will be there somewhere, hiding in the woods. Curious to read more? Click on the interview with the brown bear, wolverine and wolf!